Michelle D. Bernard joins MPR’s the Daily Circuit to discuss whether women govern better than men. 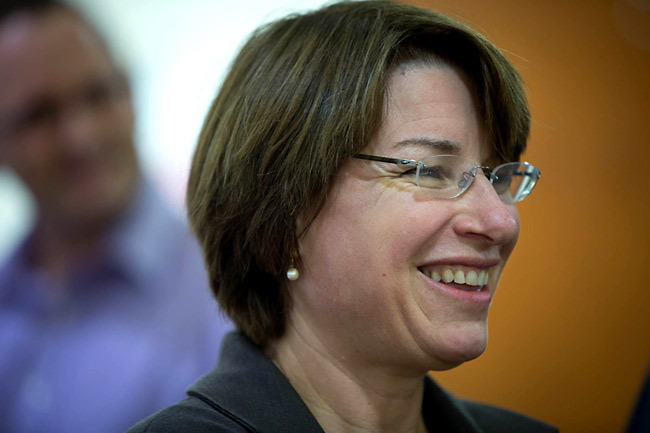 Minnesota Democratic Sen. Amy Klobuchar is one of 20 women serving in the U.S. Senate. And although that sounds like a rather paltry number, considering women make up a bit more than half the voting pool in the country, it’s an all-time high for the Senate. If you ask them what they bring to the Senate, almost all of them say things like this: more collaboration, less confrontation; more problem-solving, less ego; more consensus-building, less partisanship. Those are fixed perceptions, not just among the senators but, research shows, among voters as well. And there is plenty of evidence, in the form of deals made and bills passed, that women know how to get things done. That’s especially true now that women chair eight full committees and many subcommittees. There is something about the Senate that crushes women when they arrive. If you think Augusta National is a bastion of green jackets and male-only grill rooms, visit the Senate. There are still spittoons, more men’s than women’s rooms, and unequal gym facilities. Seniority, stentorian oratory and meaningless courtesies abound. All the male senators see themselves as starring in a remake of “Advise and Consent,” with themselves as lions. Women, by contrast, come in as lambs, anxious to get along, and they do. The women have a bipartisan supper club of sorts where they get together and get to know one another. Then- Senator Hillary Clinton of New York, a Democrat, had a shower for Senator Kay Bailey Hutchison of Texas, a Republican, when she adopted twins. Klobuchar, a Democrat, helped to throw a party for Republican Senator Susan Collins of Maine before she got married last summer.